Bill Fowler is Senior Vice President, Scholarship Program at the Daniels Fund. Bill joined the Daniels Fund in April 2012. He oversees all aspects of the Daniels Scholarship Program, including the community-based selection process, student support, employer and university relationships, scholar success programs, and scholar alumni relations. Bill also oversees the Boundless Opportunity Scholarship Program. Prior to his position at the Daniels Fund, Bill served as Chief Financial Officer and Chief Operating Officer of Daniels & Associates, L.P., a privately owned media and telecommunications investment bank founded by Bill Daniels in 1958. 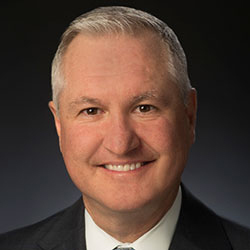 Bill Fowler was responsible for the accounting, finance, treasury, human resources, information technology, and marketing functions of the firm. Bill is a board member of the NASBA Center for the Public Trust. He is a current board member and past board president of the Colorado Golf Association, and past board member and treasurer of the Jeffco Schools Foundation. Bill is a certified public accountant, and holds a bachelor’s degree in Accounting from Colorado State University.